On the 40th Day after the birth of Jesus two people met. Well, actually 5 people met, but two of them have acquired special titles through the history of the church: Mary (the Theotokos) and Simeon (the Theodochos). But Mary and Simeon have more in common than just similar sounding Greek nicknames. 1. Mary and Simeon both point us to Jesus, the Incarnate God of our Salvation. Theotokos means the ‘God-bearer’. We call Mary the Theotokos because the One she bore in her womb was God Himself. Theodochos means the ‘God-receiver’. We call Simeon the Theodochos because the baby Simeon received into his arms was God Himself. Mary and Simeon don’t get exalted titles because of who they are or something they’ve done. They get these special names because of who Jesus is. These titles don’t exalt Mary and Simeon, but rather humble them, and us as well, as they point us to the lengths to which our God has gone to bring us salvation. That little baby laid in a manger by Mary and lifted up in his arms by Simeon was none other than the Lord of Heaven and Earth, the Incarnate Word, God the Son. 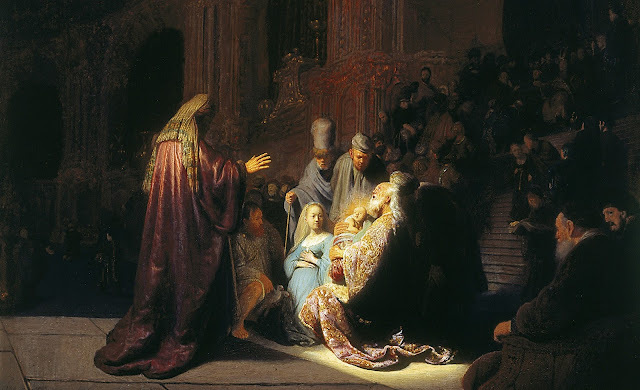 Luke might not use the titles Theotokos and Theodochos, but he does tie Mary and Simeon together in another way: through the words that come out of their mouths. When the angel Gabriel brought Mary the news that she would be the mother of Christ, her response was: ‘Let it be to me according to your word’ (Luke 1:38). When Simeon blessed God as he held the baby Jesus in his arms, he asked the Lord to let him depart in peace ‘according to your word’ (Luke 2:29). Both Mary and Simeon speak out those identical words, ‘according to your word’. For both the Theotokos and the Theodochos received and trusted in the Word of the Lord. God announced His Word to both Mary and Simeon. And God’s Word worked faith in both Mary and Simeon. In both cases, faith came through the Word. And that’s not only true of Mary and Simeon. That’s how faith comes about. ‘Faith comes by hearing, and hearing by the Word of God’ (Rom. 10:17). Mary and Simeon aren’t rewarded by hearing God’s Word because of their great faith. No! It’s the other way round! They hear God’s Word, and that’s what produces their great faith.